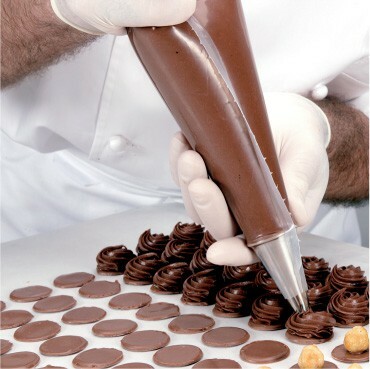 1 Using an open star tip, pipe a gianduja rosette onto each chocolate disc. 2 Finish the candies by adding an almond on top of each. 3 Store in an airtight container at 57& to 61&F/13.9& to 16.1&C in a dark, dry place. 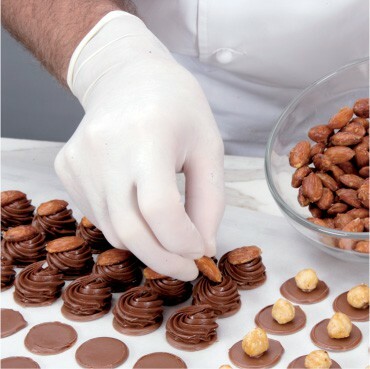 – Once the gianduja starts to crystallize, pipe onto a plain chocolate disc. – Immediately place a caramelized almond on the praline. – Finished Almond Rosette Pralines and Hidden Hazelnut Pralines.